In September, an update to CMS’s Inpatient Prospective Payment System increased the reimbursement bundle for primary and revision total ankle replacement procedures. The change will begin at the start of the 2018 fiscal year and will “move total ankle replacement from a broad, lower-paying joint category that includes total hip and total knee replacement that yielded thin margins and lower utilization into a higher-paying Medicare code, “ says Greg Berlet, MD, Orthopedic Foot and Ankle Center in Columbus, Ohio. The alternative surgical option to replacement, ankle fusion, is a good option for pain relief for such patients, but replacement ideally restores functionality of the joint, while fusion generally reduces joint function. Berlet says the update is needed because knee replacements by comparison are more predictable, and usually needed because of normal wear and tear and age. Ankle replacement, by contrast, is more complex, requires longer operative times, and may need other work such as ligament repair that is uncommon in knee replacements. Berlet believes the business impact of the decision is that hospitals will be much more willing to embrace total ankle replacement in their musculoskeletal service line, and be more willing to partner with physicians. He further expects the reimbursement decision to remove the financial barriers in place when accessing ankle replacement. The opinions of Philip Betbeze and Dr. Greg Berlet are theirs alone and do not necessarily reflect the opinions of Wright Medical. Gary Sayles broke his ankle in a 1980 hunting accident. Years later, it became unbearable and he went to Dr. Jason Nowak of Shasta Orthopaedics in Redding, California for a total ankle replacement. Gary was implanted with the INFINITY™ Total Ankle System on April 8, 2015. Dr. Nowak is one of a few physicians in the Redding area that routinely performs total ankle replacements. New technology allows Dr. Nowak to align the ankle replacement pre-operatively on a computer, which saves time in the operating room. Dr. Nowak says that the ideal patient for an ankle replacement is 55 or older who has a low impact lifestyle (i.e. ; walking, biking and swimming). Since Gary’s replacement surgery, he has been able to get back to walking regularly and is no longer suffering from pain in his ankle. According to Dr. Nowak, 10 years after the ankle replacement surgery 90% of patients are doing well. The opinions of Gary Sayles and Dr. Jason Nowak are theirs alone and do not necessarily reflect the opinions of Wright Medical. Cynthia Pittman-Osula has suffered from hammertoe since 1997. The pain was bearable until 2013, when she noticed the bottom of her toes were becoming callused. Cynthia decided to see her physician, Dr. Berkowitz, who suggested she get the MITOE™ procedure versus a K-wire procedure. Dr. Hodges Davis, a leading expert in foot and ankle orthopedic surgery at OrthoCarolina’s Foot & Ankle Institute in Charlotte, North Carolina, explained the MITOE procedure and its advantages. He pointed out that the surgery involves taking out one of the joints, straightening the toe, and inserting an implant inside the bone. The implant has a screw on one side and a spike on the other to hold the toe straight and is designed to stay in permanently. An advantage of the MITOE implant for a hammertoe surgery is a quicker recovery time, allowing a faster return to work and open toe shoes. There have been over 10,000 MITOE procedures completed in the U.S. and complications are very rare. Cynthia, who received the MITOE implant, was able to travel on an airplane and wear open toe shoes in just five weeks after surgery. The opinions of Cynthia Pittman-Osula and Dr. Hodges Davis are theirs alone and do not necessarily reflect the opinions of Wright Medical. These results are specific to this particular individual only. Individual results and activity levels after surgery vary and depend on many factors including age, weight and prior activity level. There are risks and recovery times associated with surgery and there are certain individuals who should not undergo surgery. Marilyn Utz has lived with arthritis for years which led to her needing both knees and a shoulder replaced. In 2014, Marilyn’s right ankle began to feel like her knee and shoulder joints pre-surgery, but she powered through the pain with an ankle brace and painkiller injections. Marilyn’s ankle degenerated to bone-on-bone and impacted her active lifestyle. She was unable to walk, garden or fish, and going to the beach was unbearable. She began to rely on pain medication just to get through the day, but she didn’t like the way medication made her feel. Marilyn knew surgery was the next step. She went to Dr. Eugene Batelli of Metropolitan Ankle & Foot Care in Totowa, New Jersey. He suggested an INFINITY™ Total Ankle Replacement. Marilyn decided to get the ankle replacement surgery and in May of 2016 she was fitted with her INFINITY™ Total Ankle. She spent three days in the hospital and six weeks in a cast, then a boot. Physical therapy helped Marilyn achieve great range of motion. Walking helped get her strength back when she was allowed to put weight on her ankle. Marilyn is now back to swimming and working at her part time job in the cafeteria of a local elementary school. She wants to use her story to educate others about the total ankle replacement surgery. The opinions of Marilyn Utz and Dr. Batelli are theirs alone and do not necessarily reflect the opinions of Wright Medical. Are you a candidate for total ankle replacement? Dr. Steven Steinlauf of Orthopaedic Associates of South Broward County strongly recommends ankle replacement as an option for patients with age and injury-related ankle issues. Vast improvements in implant technology have led to better ankle functionality. Dr. Steinlauf points out that many people know about knee or hip replacement but they should also know about the option of total ankle replacement. The opinions of Bella Berler and Dr. Steven Steinlauf are theirs alone and do not necessarily reflect the opinions of Wright Medical. In 2010, Kay Patton was at home doing yard work in preparation for a large storm when she fell from a ladder and shattered her ankle. Kay went to see Dr. Sharrona Williams of Ortho Atlanta in Newnan, Georgia, who rebuilt her ankle using bone grafts and screws. Although Kay’s ankle healed with time, she began to experience severe post-trauma arthritis. Kay had a second surgery one year later to remove the plates and screws, but she continued to experience so much pain that she had trouble walking. Dr. Williams recommended Kay consider receiving the INBONE™ Total Ankle System, explaining patients are likely to recover fully with a full range of motion in the joint, though the road to complete recovery can be difficult. Wanting her life back, Kay decided to have the procedure done. Dr. Williams explained that the ideal candidate for joint replacement is someone 65 or older who does not smoke, is not overweight, has no deformities and does not perform a laborious job. She notes that the surgery also can and has been performed on much younger patients. By sharing her story, Kay hopes to help someone suffering from ankle pain who does not know total ankle replacement could be an option for them. Thanks to the surgery, she can once again participate in all of the activities she loves, including walking, swimming, gardening and cooking. The opinions of Kay Patton and Dr. Sharrona Williams are theirs alone and do not necessarily reflect the opinions of Wright Medical. Marilyn Utz was in pain 24/7 from her arthritic ankle and it was getting worse. She became nervous when the weather produced snow and ice, and she dreaded using the stairs. The 69 year-old Ramsey, NJ resident finally determined that living in pain was no life at all and she went to Totowa based physician, Dr. Eugene Batelli. Dr. Batelli discovered that more than 80% of Marilyn’s ankle was arthritic and recommended she replace her ankle. Batelli explained that, “the advent of these newer implants is allowing people to do what they want to do and return to their active lifestyle.” After three years of suffering, Marilyn scheduled her surgery at the Hackensack Medical Center. Mrs. Claus suffered from pain and discomfort in her right ankle due to arthritis that began to interfere with her Christmas duties. This past fall Mrs. Claus contacted Dr. Matthew A. Hopson, a foot and ankle surgeon at TPMG Orthopedics and Sports Medicine in Newport News. Dr. Hopson found that Mrs. Claus had almost worn out her ankle. 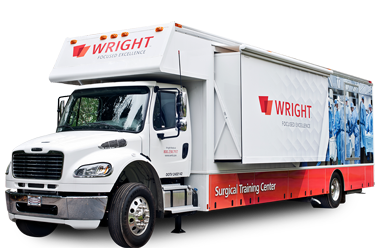 He recommended that she receive a total ankle replacement “TAR.” A 3 dimensional CT scan of Mrs. Claus’s ankle was done with the Wright Medical Prophecy Imaging system to design the patient specific INFINITY™ pre-operative navigation alignment guides. In late September Mrs. Claus underwent her ankle replacement surgery. Three months later she is walking unassisted, “doing stairs” and helping Santa prepare for Christmas. She attends bi-weekly therapy sessions and credits her fast recovery to Dr. Hopson’s skill and great staff. The opinions of Mrs. Claus are hers alone and do not necessarily reflect the opinions of Wright Medical. Kay Patton lived an active lifestyle until she fell from a ladder while doing yard work at her home and shattered her ankle. After the injury, she started seeing Dr. Sharrona Williams of Ortho Atlanta in Stockbridge, and the doctor rebuilt her ankle using bone grafts and screws. Kay decided to have the procedure done. She wanted to continue to live the active lifestyle she loved and not worry about her ankle anymore, and new technology such as the INBONE Total Ankle System have vastly improved outcomes for patients. Kay was a candidate for a total ankle replacement, however, not all patients are. If a person is obese, has vascular issues or does hard labor, they might not be a candidate. By sharing her story, Kay hopes to help someone who is suffering from ankle pain and does not know total ankle replacement could be an option for them. Dr. Jason DeVries recommends a total ankle replacement for patients who are suffering from debilitating, end-stage arthritis in their ankle and can no longer tolerate the pain. A patient typically spends the day of the surgery and one night afterward in the hospital. As Dr. DeVries explains, the patient will not be able to put any pressure on their ankle for two to four weeks after the procedure. After that time, they will begin physical therapy and walking with a supportive boot ankle. Following an ankle replacement and the appropriate recovery time, a patient should experience pain relief and the ability to walk around freely as well as return to participating in the activities they enjoy. The opinions of Dr. Jason DeVries are his alone and do not necessarily reflect the opinions of Wright Medical. Dr. Steven Neufeld of Falls Church, Virginia, has helped bring total ankle replacements to the forefront of medical procedures, pioneering the program in the INOVA Health System. The surgery provides his patients with a pain-free ankle and full range of motion, allowing them to get back to the activities they love. To see the benefits of total ankle replacement you have to look no further than Dr. Neufeld’s patient Karen Navarro, who spent years playing softball and had suffered from ankle pain ever since she sprained it at the age of 25. Now 54, Karen reached her breaking point when she could no longer perform everyday tasks. Upon meeting with Dr. Neufeld and learning total ankle replacement was an option, she immediately scheduled an appointment to have her ankle replaced with the INFINITY® Total Ankle System. The procedure was a success and returned her ankle to its pain-free state. She now goes to the gym regularly and is back to enjoying the outdoors and trips with her fiancé. The opinions of Dr. Neufeld and Karen Navarro are theirs alone and do not necessarily reflect the opinions of Wright Medical.